La Palma (also know as “Isla Bonita” – “beautiful island” and the “island of San Pedro”) is the Canary islands most North-Westerly member and the furthest one from the Moroccan African mainland. 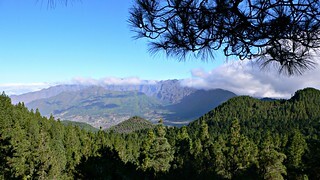 La Palma, like the other members in its group, also comes under Spanish jurisdiction. Its impressive collapsed volcanic peak (Taburiente), rising about 7km from the sea floor and just under 2.5km above sea level is also the site of an important astronomical observatory. The island’s interior is dominated by high peaks, impressive gorges, calderas surrounded by mountains and wonderful ridges. La Palma island is a both a sun-baked, harsh terrain and a nature-lover’s true rugged paradise. The Canaries are thought to have been originally inhabited around 1000 BC and the origin of these natives (Guanches ) is unclear, although they may share common ancestry with the North African Berbers. The Genoese invaded La Palma in the 1300’s AD, followed by the Spaniards in the early 15th century. Laurel forests also including Canary islands juniper, pine, sweet and white broom dominate, with the last two species native to La Palma and Tenerife. Giant and lesser lizard, red-billed chough, chiffchaff, chaffinch, goldcrest and quail abound, most of them also being native to La Palma and/or the Canaries. Due to its relatively small size and dominance of mountains, forests and volcanoes, there’s no mass-tourism in La Palma. Rather, visitors go there to enjoy the fantastic natural surroundings as well as for peace and quiet. La Palma’s geographic position makes it ideal for year-round sun, hiking and relaxation-type holidays. The local economy is based on tourism and agriculture. Bananas are mainly grown in the valley of Los Llanos de Aridane on the western side of the island. La Palma’s volcanic soil grapes and particularly the wine are internationally famous, and the island also exports sea salt, bird of paradise flowers, avocados, beef and goat cheese. The great variety of fish caught there go for mainly local consumption. The capital Santa Cruz de La Palma is located north of the airport and along an old lava flow. It contains exquisite Canarian architecture and is lovely for wandering around, particularly at the waterfront. Its history includes sackings by pirates and later reconstruction/fortification, with the Castillo de Santa Catalina and Castillo de la Virgen both excellent surviving examples of this work. There’s a lovely Town Hall and excellent Naval and Natural Science museums. Try visiting the atmospheric neighborhood of San Telmo and the Church of Santo Domingo built on the foundations of the hermitage of San Miguel (patron saint of Flanders). There’s also excellent shopping in Santa Cruz, particularly for clothes, arts and crafts – but make sure you don’t miss out on the wonderful cigars! Also, look out for the wonderful traditional festivals (fiestas) throughout the year.